The correct decision regarding to what type of track should be used in High-speed lines is one of the topics that has generated more discussion and controversy over the last few years. In addition, this decision is very influenced by the tradition, philosophy and design principles of the different countries. 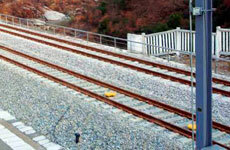 This fact is fundamentally due to the multitude of constraints and influencing factors that define as most appropriate, the use of a ballasted track against a ballastless track, or vice versa. However, the present research intends to look beyond and review the main High-speed projects of greater relevance and transcendence that are being or will be realized in the next years, around the world, to observe if some of the two typologies is presenting a greater implementation, and the main factors that are motivating this decision. In addition, the new conditions that are appearing in some countries will be analysed, related to the demand for greater performance of design speed and design life, as well as the influence that these new demands will have on the decisions related to the type of superstructure to be installed. Finally, a comparison of all these different design philosophies will be carried out, in relation to the Spanish High-speed model, in order to generate a brief discussion of the main differences and similarities found. The final objective of the present study is to analyse current trends in superstructure design and to help the debate on the type of track to be used in the High-speed lines that will be developed in the near future.